Do you stress every year looking for the perfect Mother's Day gift? I like gifts that are practical but with a unique spin. Something I can use that's either a little different or super special is the kind of gift I love to receive. I've put together a few recommendations for fabulous Mother's Day gifts for the special mom, mother-in-law, grandmother, sister, aunt, mother figure, or self (hey, I'm not above buying a gift for myself!). S'well Water Bottle ($35) - Who couldn't use a little encouragement to drink more water? S'well bottles make the perfect gift because they are the type of gift that's slightly too expensive to treat yourself, but it's within ideal dollar range to gift. There are 2 different sizes and so many cool colors and designs to choose from. "Ladies First" Canvas Tote Bag ($34) - I seriously can never have enough canvas totes. I use them for toting goods from the farmers' market, packing books and magazines for the beach or pool, and as gifts. I love the black, white, and gold color scheme of this one, and of course, "ladies first" is perfect for Mother's Day! Color Me Stress-Free Adult Coloring Book ($14) - Adult coloring books are all the rage and for good reason. The art of coloring can be very relaxing and soothing. I received a sample in the mail a few months ago, and I've been hooked ever since. When mom needs to unwind, she can open up this book which includes over 100 coloring templates and colored pencils. Sanuk Yoga Sling Sandals ($38) - Remember my gift objective...practical and unique. These sandals definitely fit the bill. They are super, super comfortable and look just as good with a pair of yoga pants as they do with a long skirt. If mom is a yogi, she'll love these for going to and from class. Delicacies Bracelet (Pineapple) ($75) - If mom is passionate about food and jewelry, then a piece from the Delicacies collection is for her. These fun food-inspired bracelets and charms are a pretty way to express yourself. I have a pineapple bracelet, and I get so many compliments on it. Scrabble Wine Charms ($2.50 per charm) - The wine glasses will never be confused again with these fun Scrabble wine charms. Mini Macarons from Baked by Melissa ($25/box) - Delight mom's sweet tooth with a fun twist on a traditional treat. Available in gift boxes of 25. Lilly Pulitzer Large Notebook ($12) - Has mom been a little scatterbrained lately? This colorful notebook is fun and functional. Perfect for daily reminders, appointements, to-do lists and more to help keep mom organized. Diptyque Mimosa Candle ($62) - It's no big secret that Diptyque candles are my favorite. They smell divine. I haven't found a candle that compares to them. 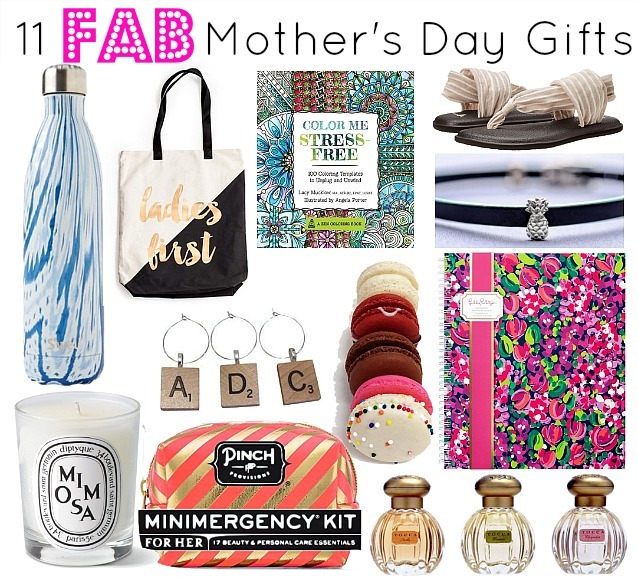 They make fabulous gifts for a special mom because they are quite a splurge, but so worth it. They are available in an array of amazing scents, but this one is one of my favorites. Minimergency Kit ($47) - Mom will never be in a pinch or a pickle again with this slender survival kit filled with essentials for getting out of any jam from chipped nail polish to a splinter to a hole in a stocking. Tocca Travel Parfum Set ($45) - I always pare down my beauty when I travel. For me that means smaller containers for all of my essentials, and that includes perfume. These small bottles smell delicious and are convenient in their miniature form. They are also an economical way to try scents before committing to buying a large bottle.